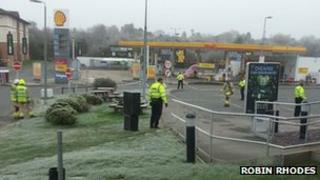 Dozens of customers were forced to wait inside a service station for nearly 90 minutes after a suspected gas leak. Peartree Services and the nearby park-and-ride, off the A34 at Oxford, were cordoned off at about 11:50 GMT after the smell of gas was reported. Shell, which operates the fuel filling station, said there had been a suspected leak of LPG (liquefied petroleum gas). Police said cars were being allowed to leave the park-and-ride. Robin Rhodes, of Winslow, Buckinghamshire, was among up to 50 customers waiting to leave the nearby service area. He said customers were eventually allowed to leave in small groups shortly after 13:15 GMT. A cordon remained in place at the site and firefighters were in attendance, Thames Valley Police said. Shell said the cause of the leak was unknown but isolator switches would shut off fuel in the case of any problem.